Who knew a single phone call from a friend 25 years ago would change my life. I was miserable and unhappy as a Wall St. secretary when that life changing call was made. Two years later I made the trek across the country to the Golden State where I fell in love with alternative healing and experienced a personal breakthrough. Now I spend my time helping others benefit from the healing arts I have mastered. It’s a fulfilling life. My passion is to help people to be empowered and live life to the fullest. All my life I have been fascinated with healing and creativity. I earnestly sought ways to find myself – both within and in my relationships. About 20 years ago I began my studies in healing and non-ordinary states of consciousness. I studied Holotropic Breathwork with Dr. Stanislav Grof, an innovator in the field of consciousness research. 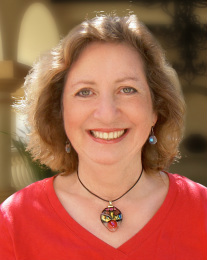 I became a certified practitioner and led about 80 Breathwork groups throughout the Bay Area. Eventually I wanted to work more individually with people - to personally support them in the healing process. In my healing practice I focused on emotional healing and helping people to heal from stress and trauma. I became certified in Hypnotherapy, and trained in: Shen energy work, Biodynamic Healing, Psychotherapy, Craniosacral Therapy, Reflexology, Feldenkrais bodywork, Chi Kung, yoga and meditation. Then, about 18 years ago, I was looking for a key to help people heal from the effects of painful experiences on an even deeper level. One morning, holding an ad which I had cut from Open Exchange Magazine years before, I found myself calling the Chi Nei Tsang Institute. It was a call that began a chain of events which was the beginning of a radical change in my view of healing. At the Institute I learned that, contrary to our assumptions, our emotional experiences are not governed by our brain alone. Emotions actually originate in the body's center, the belly. So when we have a "gut" feeling," or can't "stomach" something, we are connecting with our bellies. The abdominal area of the body is often neglected in the healing process. In most healing arts the work is from the periphery of the body towards the center. Yet the abdomen is the energetic and emotional center of the body and the place where breath and movement begin. With CNT I'd found a way to help people to go to the very roots of physical and emotional problems. In order to do this I learned how to provide the safety and support to work on very subtle and deep levels. I learned to help people unwind the stored emotional energy in their bodies while training their internal organs to work more efficiently. I saw people become more awake, clear and experience an inner strength right at their core. Certain conditions are necessary for healing to occur. In my practice I create a sacred space with respect, caring, listening and skill. My touch is deep, soft, and gentle. The abdomen, perhaps more than any other part of the body, requires the touch of tenderness, strength, compassion, and absolute presence. After giving CNT sessions for about 18 years, I see more and more how the human organism always functions as a whole, with our various organs, tissues and energies nourishing and supporting one another to maintain equilibrium. When one gets back to the basic flow of energy, embracing its elemental qualities as it moves, very simple, profound things happen. At the beginning of my training, when I began receiving CNT sessions, I noticed a surge in my creativity. I was a painter and my work shifted to mosaic art. I read everything I could about the creative process and now I am dedicated to promote the creative impulse in all my clients. So, in addition to specializing in healing from stress and trauma, I specialize in helping people with creative blocks. Writers, dancers and other artists are a joy to work with. I believe that there's creativity in everyone asking for more expression. Whatever issues you may have I support you as a whole person. In this place of deep acceptance and support, your physical, emotional, mental and spiritual bodies can relax, allowing your body's inherent healing abilities to arise and your energy to flow more freely. Chi Nei Tsang creates an inner experience of safety and balance; basically a home base where one can experience health on many levels and integrate that experience into daily life. Whatever your issue or concern, healing is a normal process. Your body holds the information it needs to heal. My endeavor is to assist you in that healing process. I appreciate the opportunity of supporting you on your healing journey!